First, obtain leek seedlings which are neither too short nor too tall. A height of 7-10 inches is about right. Where to find seedlings? You can produce your own from seed. They are quick to sprout but initially slow to grow. Plan on 10 weeks before the seedlings achieve transplanting-size. I take the easy route, and obtain seedlings from my local, organic grower. The grower sells the young leeks in cell-packs, as pictured above. There are many stems crammed into each cell. Next, release the seedlings from their cell-pack prison. To do this, tear the thin plastic of each cell, and carefully dislodge the seedlings, all in one clump. 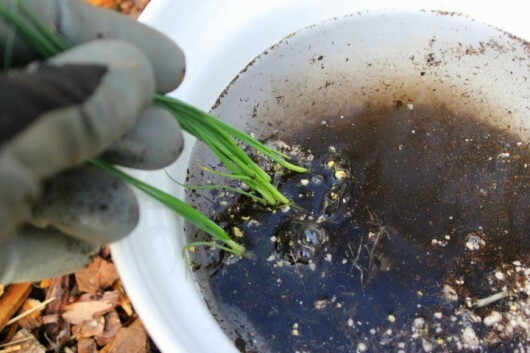 To separate the seedlings without damaging their roots, just drop them in a big bowl of water. Swish them around for a second or two. Voila! 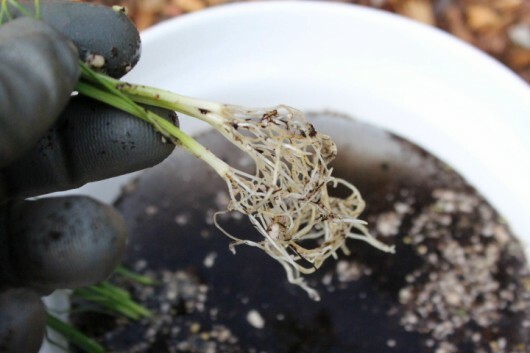 With the soil washed away, the stems can be easily pulled apart. Return the stems to their bowl of (now-quite-dirty) water. 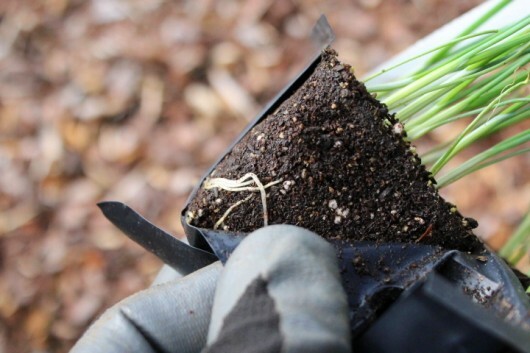 You may have heard that the roots and tops of leek seedlings should be trimmed before planting. But in my experience, trimmed leeks do not perform any better than un-trimmed leeks. 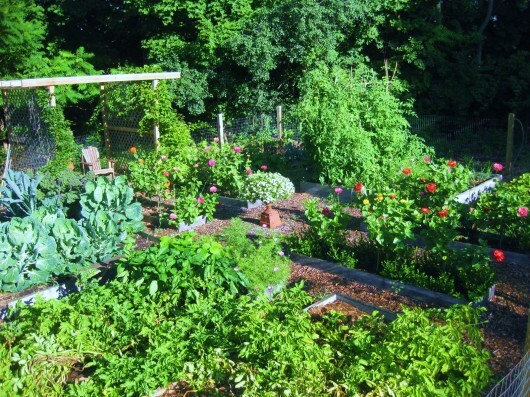 Do you grow your veggies in raised beds? Good for you. Leeks always perform best in the non-compacted, rock-free soil such beds afford. 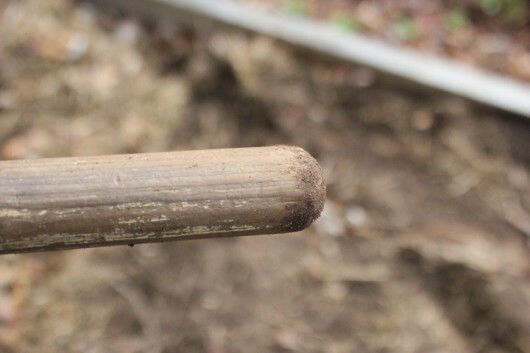 Plunge the handle into the soil, making holes that are 2-3 inches wide, and 5-6 inches deep. 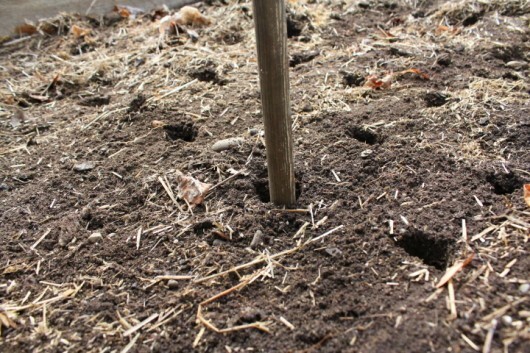 If the holes won’t hold their shape, the soil is too sandy. In that case, amend the bed with shredded leaves, weed-free straw, or compost. Leeks love a mixture that is rich in organic matter. Space the holes 6-9 inches apart on all sides. 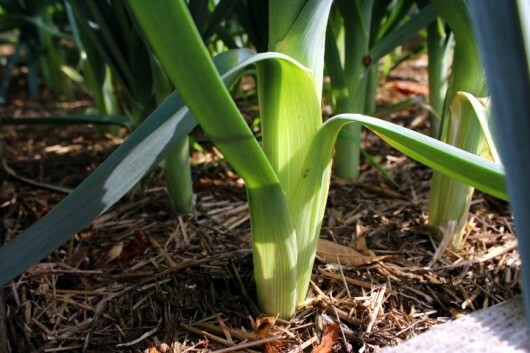 Leeks need elbow-room in order to develop fat shanks. In the photo above, you’ll notice bits of greenery growing in the path beside the bed. These are not weeds. They are the run-away daughters of day-neutral strawberries that grow in a neighboring bed. I’ll cut these rooted runners tomorrow, and reset them as new plants. This, of course, will offend their sense of independence. But that’s too bad. And drop it into a hole. Depending on the length of a seedling, only two inches of growth will be visible above the soil-level. That’s perfectly fine. Now, run back to the house, and retrieve a bright-pink watering pitcher. 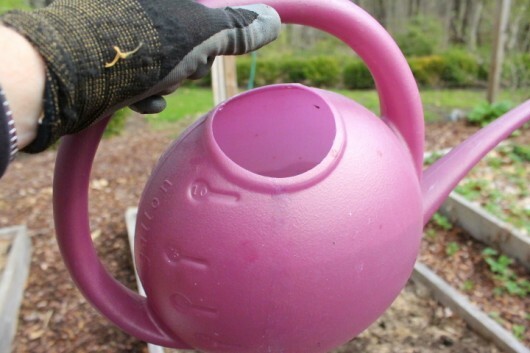 Use the pitcher to fill every hole with water. As the water drains, a small amount of soil will wash down, covering roots but not stems. 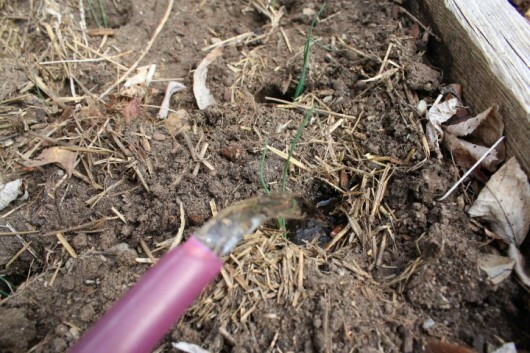 And here’s the beauty of this planting-system: As the leeks grow, overhead watering (provided either by Nature or a sprinkler) will gradually cause the surrounding soil to refill the holes, keeping the lower stem dark, and thus “blanched.” The blanched part is the most tender, delicious part of a leek. If, over time, the holes refuse to back-fill on their own, just help them along. 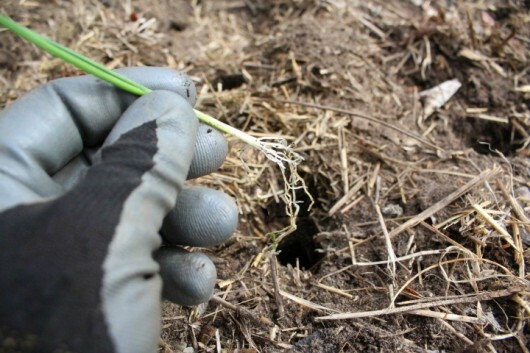 Return a little soil to the holes every week or two, as growth becomes evident. 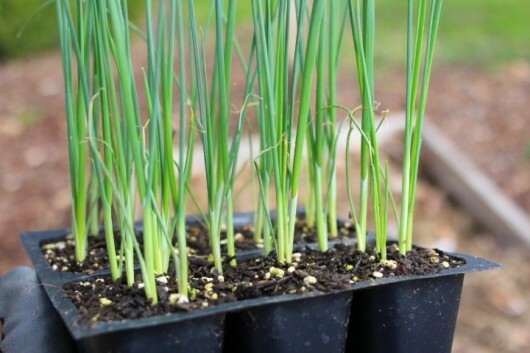 When to Plant: You can plant leeks as early as two weeks before your last-expected spring frost. 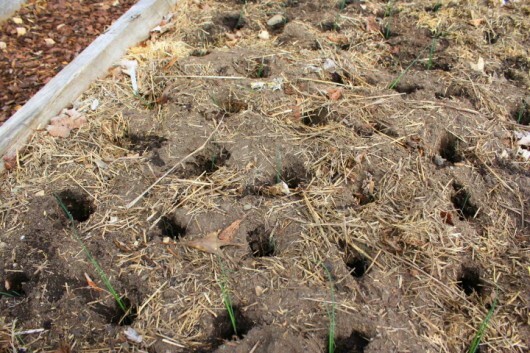 Here in New York’s Hudson Valley (zone 5-b), I plant leek seedlings between late-April and mid-May. Exposure: For the most productive plants, choose a site that receives all-day sunshine. Leeks that are planted in part-shade can not attain their true potential. Water: Like most vegetables, leeks perform best when they receive one inch of water per week. Mulch: To reduce weeds, and also to increase moisture-retention, mulch the plants after the holes are completely filled with soil. I mulch mine with either shredded leaves or weed-free straw. Harvesting: When the white part of the stem grows to one inch in diameter, feel free to harvest your leeks. Most varieties take 90 to 120 days to mature. But you needn’t rush to harvest your crop. Mature leeks are remarkably frost-tolerant, which means you can harvest as needed, usually until the ground freezes solidly. And here are the leeks I planted, looking handsome indeed by August. 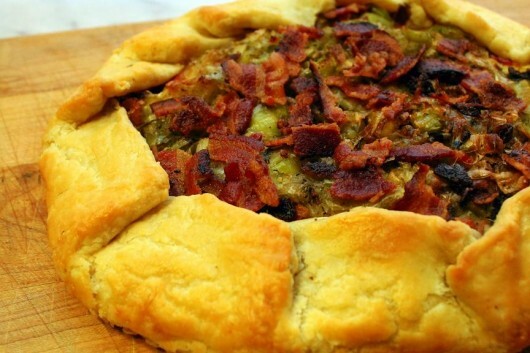 I made this Rustic Leek & Bacon Tart just for you. Here’s the recipe. As you have seen, leeks are very easy to plant. Make the holes I described, refill them gradually, and you’ll end up with beautifully-formed, well-blanched stalks. Was this tutorial helpful to you? You can let me know by posting a comment. As always, I cherish your thoughts. Thank you, thank you, thank you, Kevin! I’ve been intimidated by leek growing since I moved to New England 4 winters ago. I’ve started from seed, but bunch too many together so they do not have enough space to plump up before planting. I’ve used your technique of end of rake holes, but spaced too closely together in the soil too. I’ve been hoping you’d speak to leek planting and now that you have, I’m going to set aside my hair-sized seedlings, heading off to my local farm stand, and going to purchase a couple 6-packs of plump leek seedlings, and getting my rake handle ready to do business! You are the greatest!!! I love your blog! This was so helpful. Thank you! We discovered a love for leeks last year when I decided to make a loaded potato-leek soup! Wow! We are definitely adding these to our garden this year. I’ve also already planted the cut off, rooted ends of leeks I’ve purchased from the store, and they are coming up fabulously well in our raised beds too! Wow!!! That is a unique and interesting way to do “hilling”! Usually I’m a little scared of growing leek because of the hilling process… but you’ve made it so interestingly simple! ehehe. Always a wealth of knowledge, you are! Like Jan, I haven’t had much success with leeks. But your method has some very helpful tips that really make me want to try again. Maybe not this year, since the gardens are pretty well planned but next year for sure. Fewer onions and more leeks, the king of the alliums! Thanks. Actually Kevin, I loved this tutorial – have always wondered how to get those little boogers apart without damaging them. Many thanks! Thank you so much for this info. Planted some already but concerned about the close grouping. Leaving for Israel for a couple of weeks, will see if I can re-do when I get back. If not, next year according to your guidance. Much appreciated. Always enjoy your stuff. Shalom. Picked up 2 packs at local farm stand. Delightful folks. Got 1/4 planted last afternoon and will get the rest in today. Thanks again, so much, for the reminder that leeks (spaced appropriately ;)) are definitely worth the effort and real estate! Warm regards to you! Thank you for teaching me how to plant them! I love your blog! Excellent post !! … as usual. I love leeks but have struggled for years with the planting and maintaining of them until harvest. More often than not, my efforts have resulted in sad, sad leeks. I will be trying your method this year with renewed hope and great expectations. Jeez … why didn’t I think of that ?!! Thank you, thank you, thank you. I am a typical southern california girl, who did not know what a leek was. My daughter and I wanted to start a garden and we grabbed a few things at Home Depot. I planted the leeks in a container (all in 1 clump). Growing nicely by the way. However, I went to our locall market and actually saw a leek for the first time. I did not realize they are so big. I will be using your method to transplant them in more spacious surroundings. Thank you for the info. Oh, I might need a bright pink watering can too. Lol. I grow leeks every year… And can’t wait for a pot of potato and leek soup come the first cool days of fall. 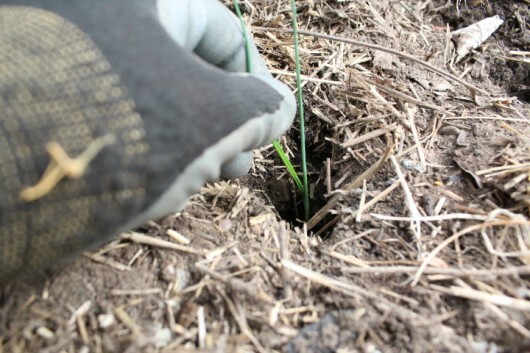 I have always grown my leeks in a long trench… Which I fill in as the plants grow. However… I like your system and plan on giving it a try when I plant my leeks next week!! Ah, that’s genius. So much easier than my usual method. Thank you! Leeks freeze really well, too, for use in cooking over the winter. Just clean, then chop roughly and throw in a feezer bag. They dont even need to be blanched. Same with onions, and oh, how nice it is not to have to clean and chop leeks or onions when the cooking impulse strikes. This was very helpful. I wasn’t going to plant leeks this year. i never had success with them. But after reading your blog, picked yp some seedlings at the famer’s market and tried your method. It was so easy. I do hope they grow. Our favorite soup is potato leek and I have always wanted to grow them! Heading out now to find seedlings! Thank you! This is brilliant. I only wish you had written this back in late Feb, before I planted my leeks. 🙂 Mine are doing beautifully right now, but I have the hilling problem to deal with. For what it’s worth, I gently-roughly ladyhandled my leeks and my onions when separating the for planting. They all survived. Hardy little beasts. Sound good to me…thank you for the advice. I can’t wait to try the chive pesto…… ..but it is too dark outside in the gardennow to go and pick the chives . Just the info I needed, Kevin. I did plant and was happy with the leeks I grew last year, but was never quite sure I had planted them properly. This year I shall be able to plant them with total confidence. It’s so nice to be able to harvest a leek or two at a time all winter long. Planning a leek chard fritatta for dinner tonight with my last two leeks! Time to plant something else in that part of the garden. We’ve been having an enviable spring here in the Pacific Northwest, and I am truly grateful for it. And I feel the same way you do about chives! Oh I wish you had posted this two months ago so I could have seeded some of them. I can’t find anyplace that sells them in cell packs like your local place. I’m so jealous! I leave the leeks, that i have planted and don’t have time to eat, right in the ground in the fall ( i don’t cover them in any way) . I live in Nova Scotia, where the winters are freezing. Just about now, or even in April, i can start enjoying the remaining leeks. I leave one or two leeks in the ground, let them go to seed and, voila, i have seeds in the fall. These i plant in trays the following March and transplant them outdoors in May. In my book, leeks are one of the easiest plants to grow! Kevin, this is a great tutorial, very well done, clear and concise. I live in Houston, so I will try this method for planting leeks in my fall garden. I don’t think they would survive the heat of our summers! But I am already harvesting tomatoes! Darnnit, I wish I read this before I planted mine today! Tomorrow I will rescue my poor leeks and plant them properly. This was so helpful to me. Thank you so much! Love your site! I have been growing leeks for several yrs now and find I can take the seed heads and drop them in the ground for next yrs plants. It works quite well. Haven’t bought any new plants since the first year. Have never tried freezing them, sounds like a great way to save them. Thank you! I started leeks from seed by winter sowing in milk jugs. They are growing verrry slowly, glad to know it can take 10 weeks until transplant size. Great ! I have a tray of seed- raised leeks to plant today. This is a very helpful set of instructions and photos, just in time for me. Thanks for the info!! I’ve planted what I thought were leeks 2 weeks ago. However I planted bulbs rather than seedlings. Since you did not mention bulbs, nor did any of the people who commented, I am wondering if I am in for a surprise come harvest time. At the very least I am sure I will have to hill the plants. I will be sure to use your technique next year. Your site is outstanding. I love to cook and garden. I tried in the past to grow leek with little success. I will follow your step by tsep directions and grow leek. I got to get planting, its getting late in the season here in Maryland. Hi Mike Hollick – You are right – leeks do not make bulbs. Maybe you planted shallots? Sheer genius! 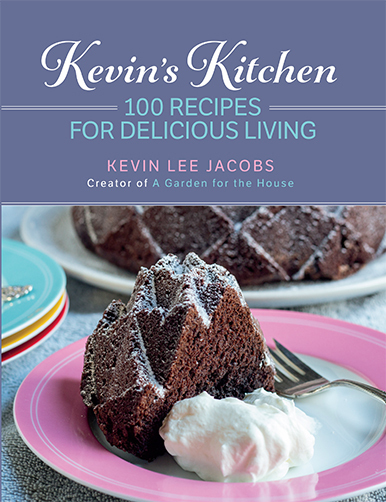 Thank you Kevin, will definitely give a try this year as I love leeks and was always intimidated to try. And, just to say thank you for your great blog — so many wonderful tips for both cooking and growing! Hi Kevin, Thank you for the tutorial on leeks. I knew nothing, but now let the planting begin! 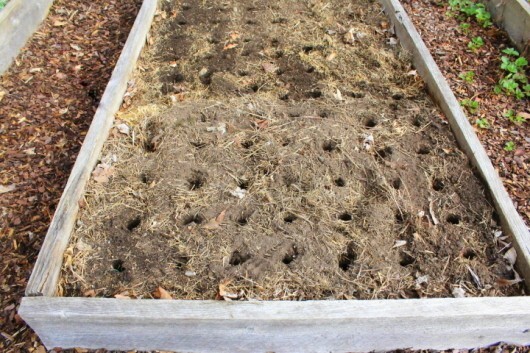 This is great – I might even get some this year if I start my seeds right away – I have sheet mulch beds that don’t freeze hard til very late. I’ve grown leeks for years with good results but I’m going to try your method. Great info, we used this technique in the Salmo Elementary Community Learning Garden in BC, Canada, and it works great, fun too for the kids! And last weekend in my own garden, thanks! Love this info, thanks. I thought I’d let you know that I bought some spring onions at the grocery store, saved the root ends, and they are re-growing in my kitchen window. They are just in water (I have well water), and are about eight inches tall. I saw the idea on Facebook. I tried it with celery, but it came back as something else (frankenfood). It was bitter and had leaves like broccoli. just thought it would be a winter project for you and would probably do good on your glass shelves at the window. Thanks for all the good info and recipies. Wow, yes, I love how you make it look so easy and what great photos! I enjoy the fun you have too. I had a whole mess of Walla Walla Sweets come up and I am thinking that I could do this same replanting process with them…what do you think? Just link to this next early spring. My father was a keen and good gardener, but as leeks youngsters could be easily obtained at out neighbours with a glasshouse, he always bought young leekplants, never sowing them. Anyway, make quite clear the broomstick made hole you plant the leeks in, should never ever be filled to the top right away. If one does so, the plant will only grow big above the ground and stay stickthin in the soil. Just try one filling up the hole and you will see what I mean. 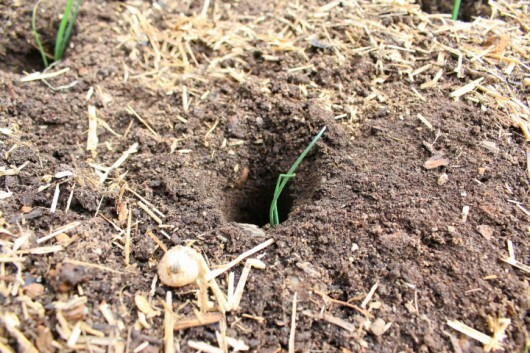 We are always told to firm the ground around a newly planted plant right away, so not (or letting nature do it in due time) filling that hole goes against all we have learned. So, please make sure your readers do not fill that hole immediately. Over here leeks are eaten quite frequently, a a vegetable, piefilling or in soups, the green parts colour peasoup a nicer green. At home we just added a bit of vinegar to cooked sliced leeks, delicious! -leeks are always so expensive -if available in our area…so i have never chosen to learn to use them ar learn how good they can be. your directions are are so nicely done and so specificly shown that even i am eager to try and broaden my leek horizons…kevin..your home and lifestyle are able to be near the level of perfection which is your good fortune….but you are sweet enough to go to great legnths to enthusiactly share your good fortune with an ever growing lucky group…kevin–how nice…b. This is the second post I recieved(actually Heavenly Challah is the second post- the scallions post was listed at the bottom , yay!) since signing up for this blog . I see the original post was actually 8 months ago, but I am ready to plant scallions let me tell you! I’ll hold off until the weather gets better though, being from Upstate New York. You never know what the weather will be like. And it being only January still. It’s a little early. Im wishing I can come to one of the Open Days! So much fun! Awesome Blog! I love it! Thanks for blogging! i will give your gradual fill-in method a try! Hi Kevin, I live in zone3 and your tips on gardening are great even this far north. I love the leeks in the deep hole instead of hilling idea. Thanks! Ok spewed-coffee laugh over running to house to get my little pink watering can! I also live in Hudson River Valley (Waterford) and I cannot wait to go out and plant the leek starts I bought at Farmers Market on Friday! I followed these instructions last year and am very pleased to say it worked like a charm. It takes a bit of digging to get them out but they are blanched just like the store bought ones & without the crazy work with conventional methods. Krista – So glad the method worked out for you. Home-grown leeks are the best leeks! Now I know why mine was such a failure previously! Definately trying them again this year. Besides herbs, I want to try artichokes and my favourite colourful swiss chard and of course a huge array of lettuce. Blight got my tomatoes so I decided to skip this year..
Can’t wait to get my leek seeds. This tutorial was great!!!!! I had no idea how to plant and grow them. This tutorial makes me think I should try these this year….. Off to find some seeds…. I started my leeks from seed indoors on March 5 in a 4″ x 6″ plastic tray. Today I transplanted them into their own little 6 packs (about 2″ x 2″) I will start hardening them off in about a week. Then about a week later they will sit and be happy in the low tunnel. I suppose I better keep my eye on the nighttime temperature though. Maybe I’ll surround them with some straw as a precaution. I suppose they will freeze if I don’t. I sure hope not. They are such handsome little guys. You made that look easy peasy..thank you Kevin! Thank you for the leek tutorial. I have not grown leeks, but would like to try now. BTW, the tart looks delicious. I have never grown leeks because of the hilling process. This method looks great. I live near San Jose in California and grow cool season crops such as onions, garlic, beets, cabbage, etc. in the fall and winter. Would leeks grow well during that time? We have some frost, but the ground never freezes. Your article is really clear and answers so many questions I had about how to grow leeks.Thanks. I’ve just planted out half my seedlings, now I’ll plan the other half using your method. I can guess already which will grow better! I harvested my leeks yesterday, May 1. They went through the whole winter just fine. I have dug them frozen in past years. But you should add to the directions to DIG the leeks. Don’t pull them out. They could break. I sliced them and steamed them briefly and then mixed them into cheese sauce. Yum! Sweet! Thank you for the very helpful information. I picked up seedlings from my greenhouse, I didn’t realize they had special planting needs. I have a very small (2ft by 4ft) raised bed. The bed is 3 feet off the ground. With your information, now know how to better utilize the space. I just planted some leeks. Not as many as you, of course. Fun doing your suggested tips. Told my 96 year old Dad who, in my opinion know everything. He did not know your method, but approved. Hi Kevin, I came here looking for some guidance on planting out my leek seedlings but have bookmarked your site because of the awesome recipes on top of good gardening advice. Thanks for the time and effort your put into this work. I living in the Rocky Mts. In Utah and all my leeks bolted to seed. We did have two weeks of around 100* heat and maybe I didn’t plant them deep enough. I will just let them over winter and try again next year. I love leeks! I forgot to plant some for this year, but it is on my definite to do list so that I can harvest in 2016. Your beautiful articles are what soooo many people get excited about each week. Thank you for sharing so much info in every article. this was so helpful! thank you! i am getting on the late side of ‘planting from seed” so will go buy some leeks as you suggest. i really appreciate how you share the simpler ways of doing something and the delight you share about the process and the results. thanks so much again! What a great article, i grow lots of garlic and i live in n. Carolina. I put the cloves in in the fall and harvest about now, around the end of may, and when the leaves,start turning brown and flowers start to form. U had written to put the leek seedlings (hope i can find some) in the ground in the Spring, does it go all thru the summer? Garlic takes many months to mature, how many months do the leeks take from the first planting. Would live to get on your site. This is a fantastically detailed account, and well written article ! Do you have any tips on how to speed up the growth of alliums ? I normally use leek offcuts from the kitchen and they take very well. With seeds I’ve been forced to switch to a tube system, by planting seeds in tubes cut from plastic bottles, I hope to minimize transplant shock and free up bed space. The soil is well manured sand with vermicompost added. It rains every three days or so. The temperatures hover between 5 and 15 degrees Celcius and the alliums hover at about 7 cm in length and there is no change, how can I boost their growth ? I was so pleased to find these instructions — being a leek lover & a California gardener, I can plant leeks now for harvest during first months of 2018. But unlike in the past, this year I ended up with a six-pack filled with LOTS of seedlings. I wouldn’t have guessed it would work to separate them as you describe, that is a really good to know! Thank you! Thank you, thank you, thank you Kevin. I have tried growing leeks from seed several times never knowing anything about them. With your tutorial I’m willingly anxious to try again. 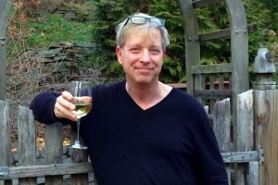 I always learn so much from your posts… gardening AND cooking! 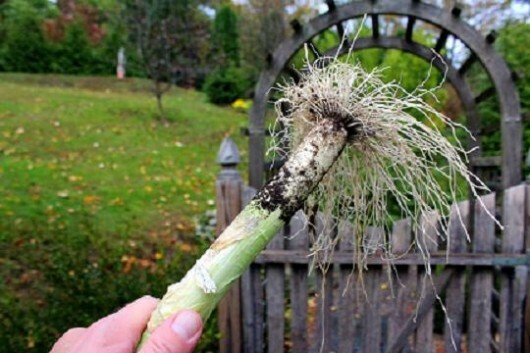 What a simply easy way to grow leeks and I never thought about dropping them (or any plant) in water when you are trying to divide without hurting the roots! Now how about a post on planting POTATOES! Do you ever plant and/or cook with elephant garlic (which is in the leek family)? Hi Elle – click here for my potato-growing posts. Can I use the same process to plant/grow/harvest spring onions? Thanks! Thank you Kevin for this in-time guidance. It’s so detailed. I just bought some leek seedlings. Never grew leek before. Your blanching method is so smart and “inexpensive”. I almost bought 3-inch diameter PVC pipes for the blanching as suggested by a Walsh gardener. We’ve just had a gardening programme on TV here in England showing leeks being planted and it looked so easy we went out today to buy some, but they didn’t come as we’d expected – instead of individual plants they’re cell grown and we just didn’t know whether we were supposed to separate them or not. We’re so glad we found your website because the people we bought them from said to plant the whole cell together and we couldn’t see how that would result in nice large leeks! They don’t look as big as yours, but we’ll have a go anyway and see what happens! Thank you again.